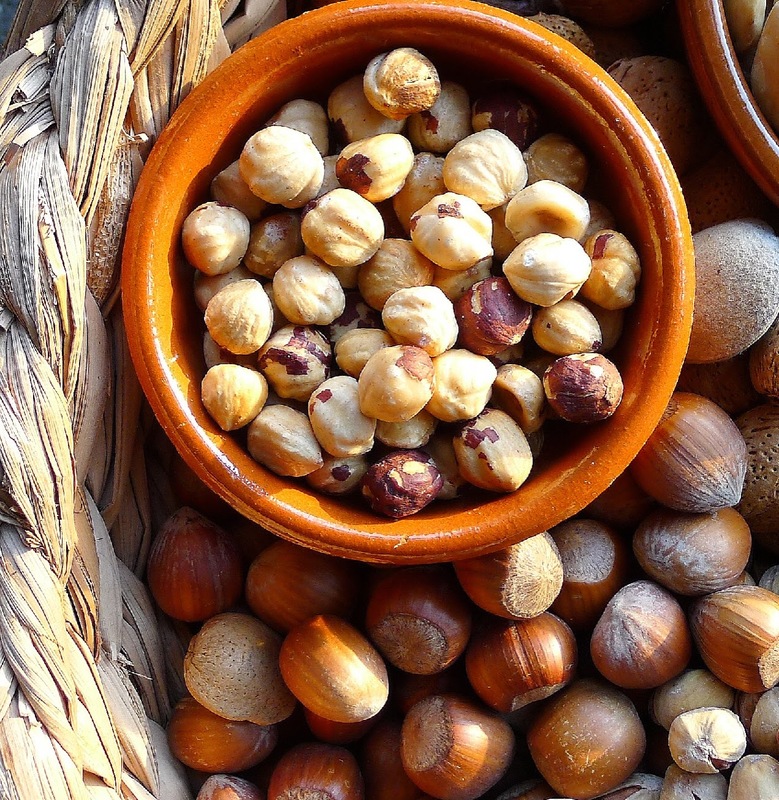 Frutos secos are nuts of all kinds, in Spain, as elsewhere, beloved at holiday time. A bowl of walnuts and a nutcracker. 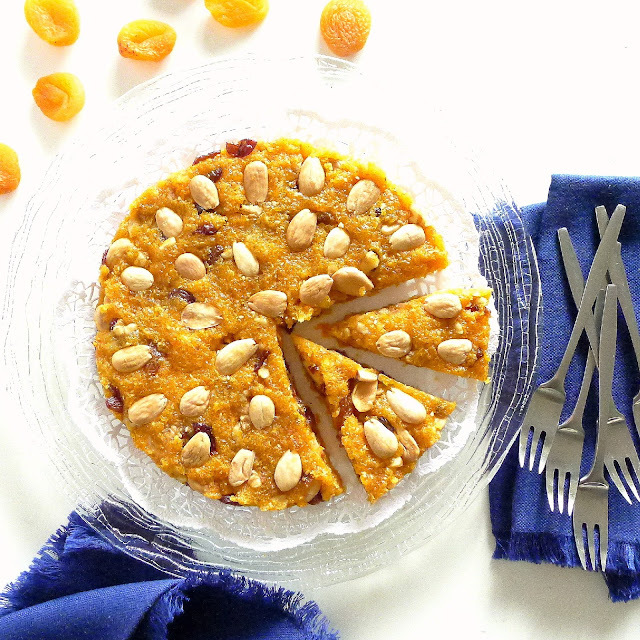 Fruitcake studded with raisins, citron and nuts. Plum pudding with currants. 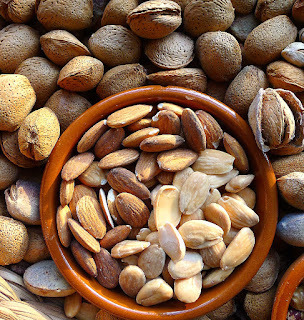 Nuts and dried fruits are cherished for winter holiday treats. In Spain, too. 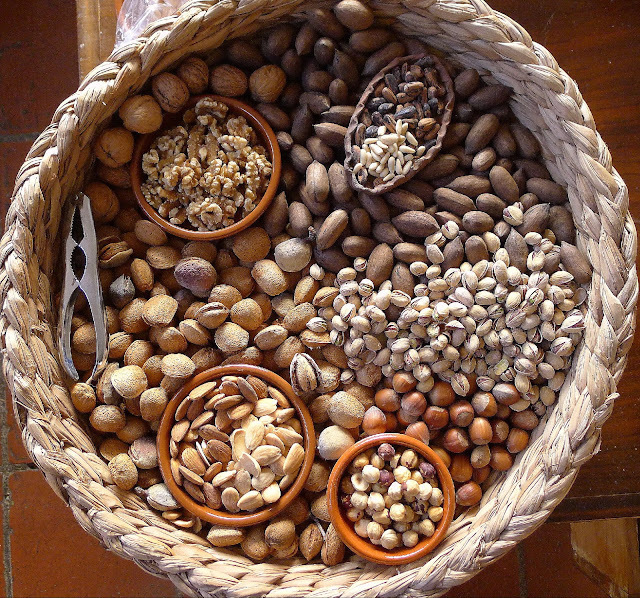 Frutos secos—all kinds of nuts and seeds—and frutas secas or desecadas—dried fruits add sweetness and cheer to a festive season. 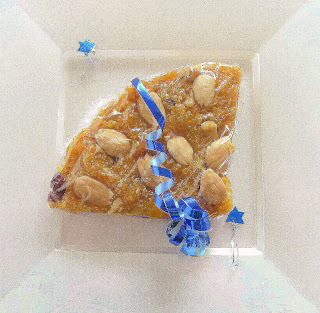 Almond confections such as turrón, nougat, and mazapán, marzipan candies, are the most emblematic. And there are many more. Dried fruits are winter treats--bottom,´figs (dusted in rice flour), center, Málaga muscatel raisins, and top, dried apricots, called orejones or "little ears." 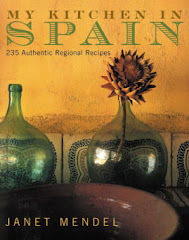 Spain is known for figs and raisins. Apricots and dates are grown in Spain, but most are imported. 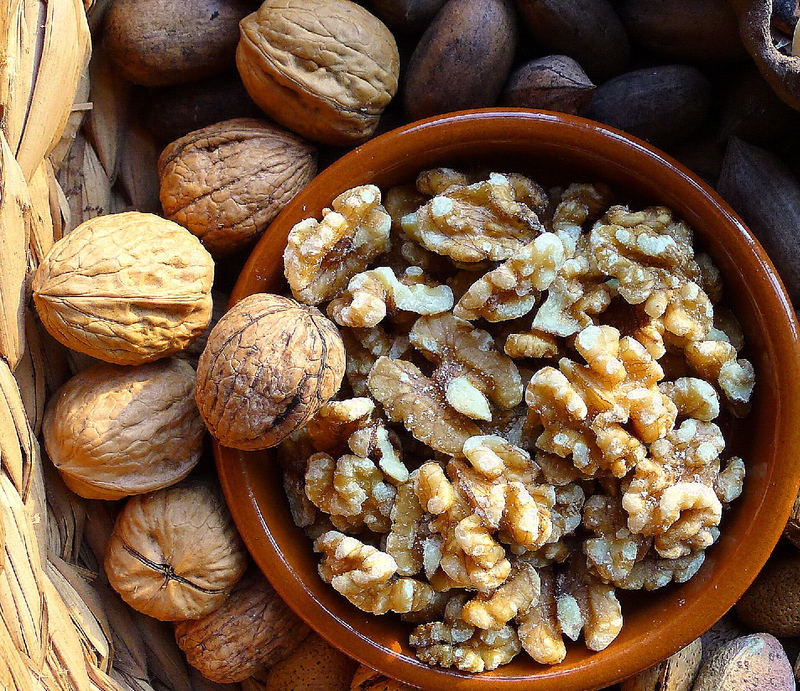 Walnuts--nueces--are grown in Spain, but most sold here come from California. Pecans, known as nueces americanas or pecanas. I buy them from a chica in my aerobics class whose family has a pecan plantation not far from my village in southern Spain. Almonds, almendras. I pick these in my garden. The ones on the right have been blanched, skinned and toasted. Hazelnuts, avellanas, grown in Catalonia. They are an ingredient in the famous romesco sauce. 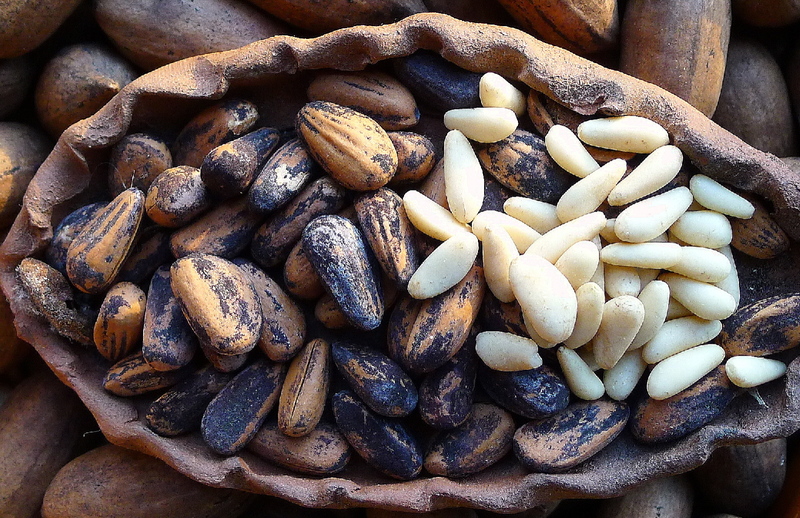 Pine nuts, piñones. Nut-bearing pine cones drop onto my patio from the tree that towers above it. 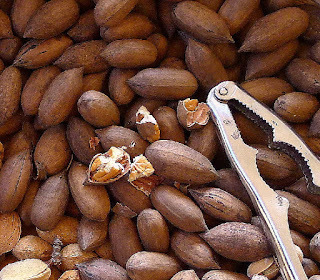 I don't have the patience to crack the tiny nuts and extract the seeds, so I usually buy them. They are expensive. Dense with fruit and nuts, sweet apricot bars are real energy bites. 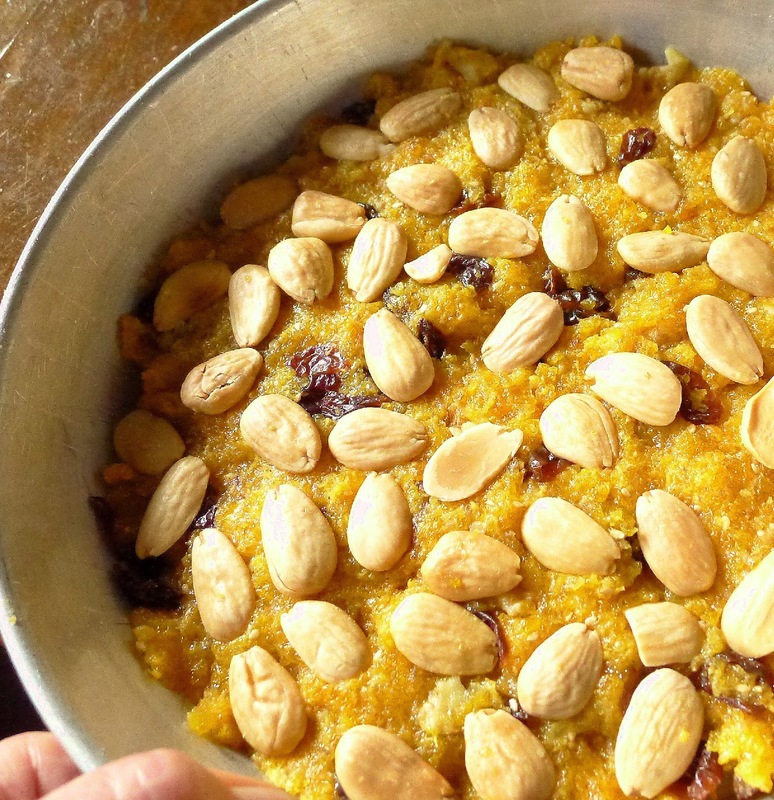 This sweet is traditionally made with dried figs ground to a paste and mixed with almonds and sesame. It’s called pan de higos, or fig “bread,” although it’s not really bread nor is it baked. 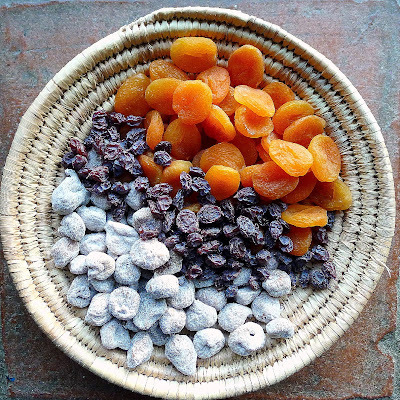 The confection can be made with any dried fruit—apricots, figs, raisins, prunes—or a mixture of fruits. It typically contains a shot of anise-flavored liquor, aguardiente or anis seco. 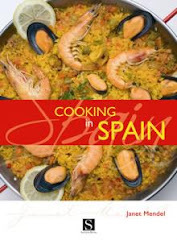 You can leave it out or substitute a sweet wine such as PX or Málaga moscatel. This version, with apricots, contains flour, which keeps the mixture crumbly rather than sticky. It’s finished in the oven to cook the flour. Serve thin wedges of apricot bars with mild fresh goat's cheese. Serve the fruit loaf like candy, cut into very small pieces. It combines well with mild fresh goat cheese. Serve a sweet wine with it. Grind the apricots in a food processor or meat grinder. I used a mini-processor, dividing the apricots and flour into three batches. Plump Málaga muscatel raisins are the sweetest in the world. However, they must be de-stemmed and seeded. Dip fingers and knife tip in flour to prevent seeds from sticking. Cut the apricots into quarters and sprinkle them with the flour. Grind them in a food processor, dividing into batches, if necessary. 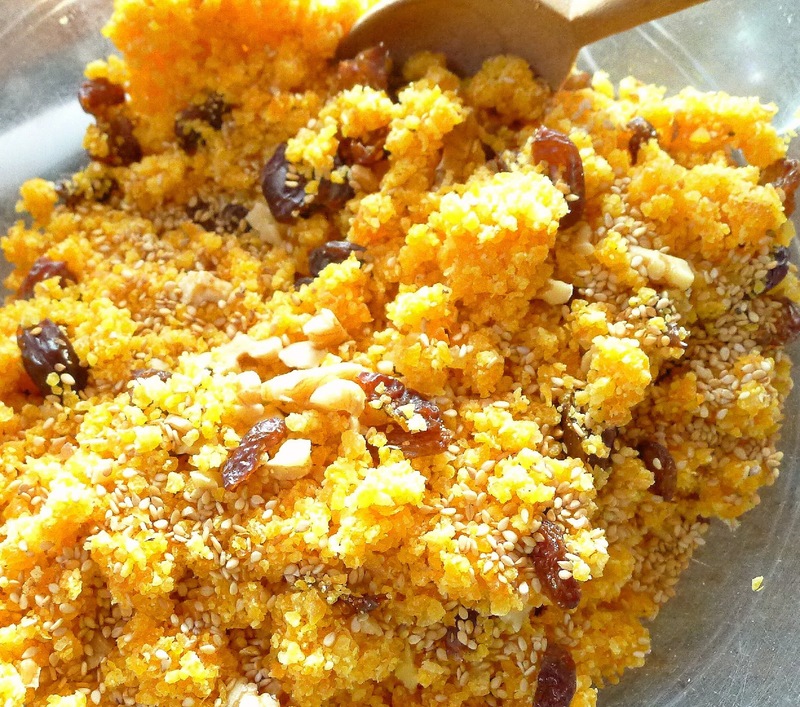 Place the apricot pulp in a bowl. Add the raisins, walnuts, sesame, zest and cloves. Dissolve the honey in hot water. Mix it into the fruit mixture with the anis liquor. Preheat oven to 325ºF. Oil an 8-inch round or square cake pan and line it with baking parchment. Press apricots and almonds into mold. Spread half of the fruit mixture in the pan, pressing it firmly. Place half of the almonds on the fruit layer and press them into the paste. Place remaining paste on top and press it into an even layer. Place remaining almonds on top. Cut the loaf into thin wedges (round pan) or squares (square pan) and place them on a candy dish. Wrap wedges of the apricot bars in plastic film. What a nice hostess gift! Squab stuffed with raisins, apricots and walnuts. Turkey breast with spinach-walnut stuffing. Fig roll (pan de higos). Layer cake with apricots and marzipan. The shortest day of the year is the brightest day. Low winter sun streams through the front windows, reaching all the way to the back of the room. 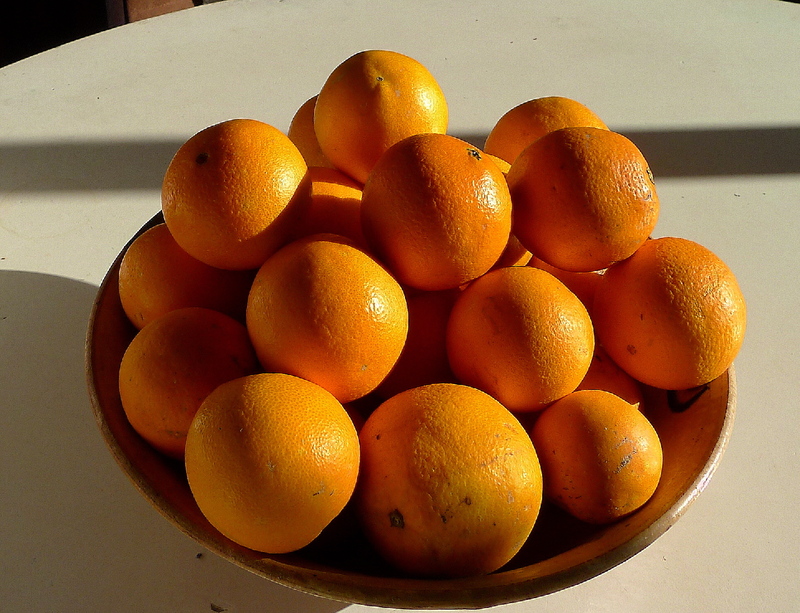 The rays light up a bowl of oranges, causing the fruit to glow like small suns. After a week of rain (and some serious flooding), the sunshine is a blessing. It warms the back of my neck where I sit at lunch and heats the water in the solar hot water system. The sun dips early behind the ridge and then it’s time to light a fire in the hearth. One thing about the winter solstice—the days are getting longer again. 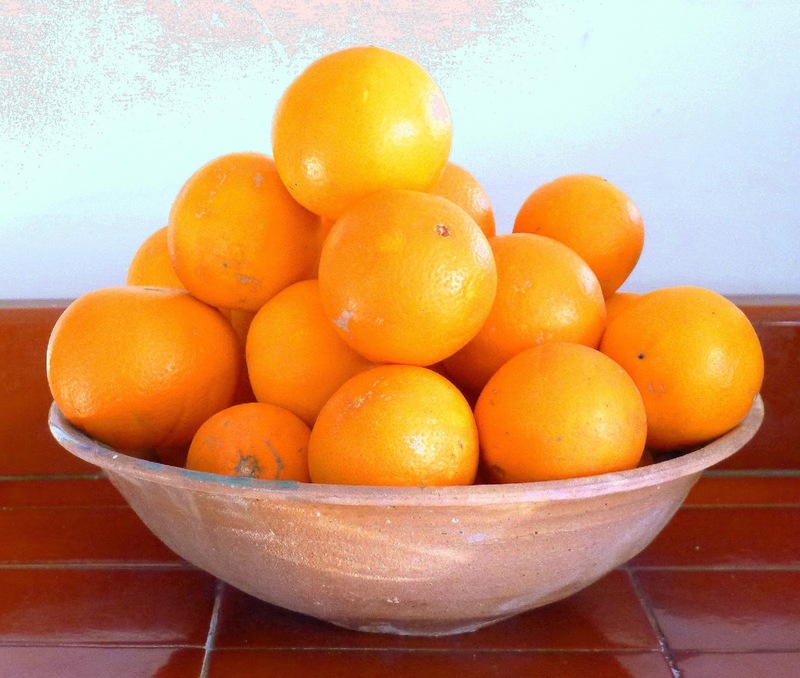 Winter is citrus season. Here’s a bright and sunny salad to light up the dark. 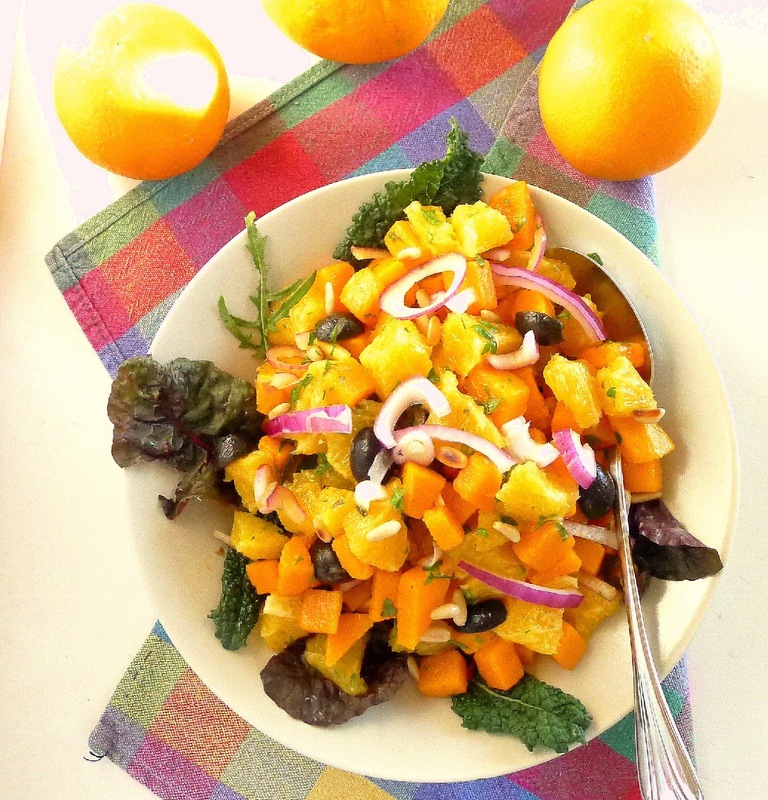 Golden butternut squash and cut-up oranges make a salad full of bright colors and flavors. in individual salad dishes as a starter. 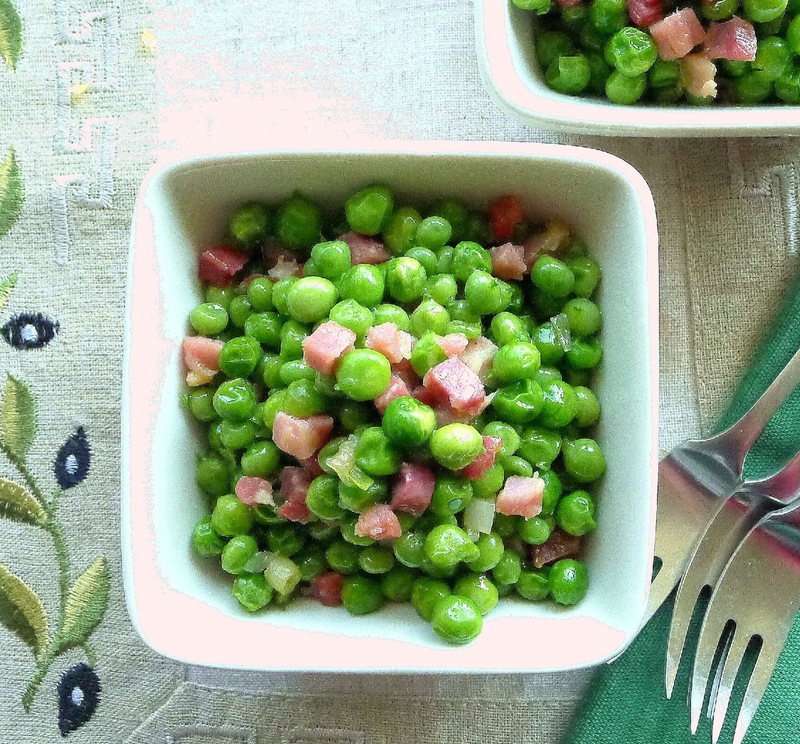 Serve the salad, room temperature, as a side dish on a festive table. It goes well with turkey, duck, pork or salmon. 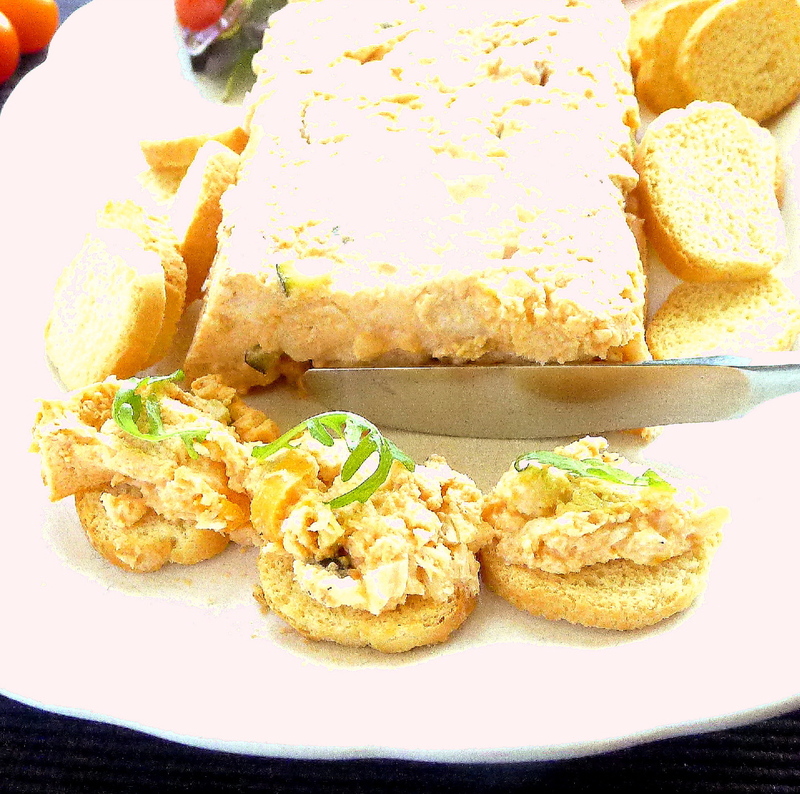 Or plate it individually and serve as a starter. 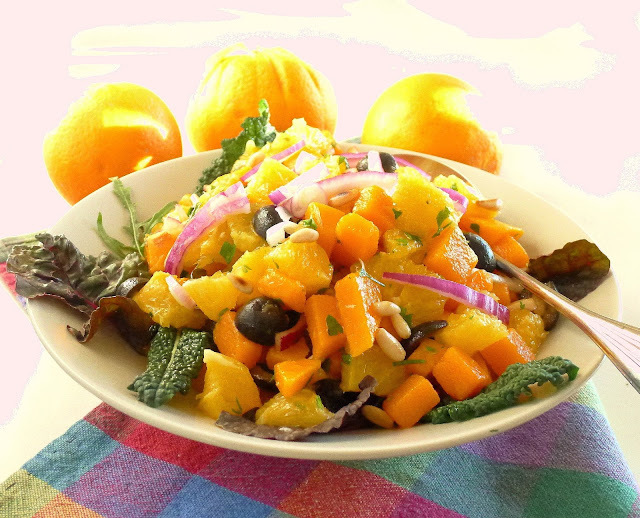 The butternut squash can be prepared with the dressing a day before serving, but the oranges are best cut up shortly before serving. 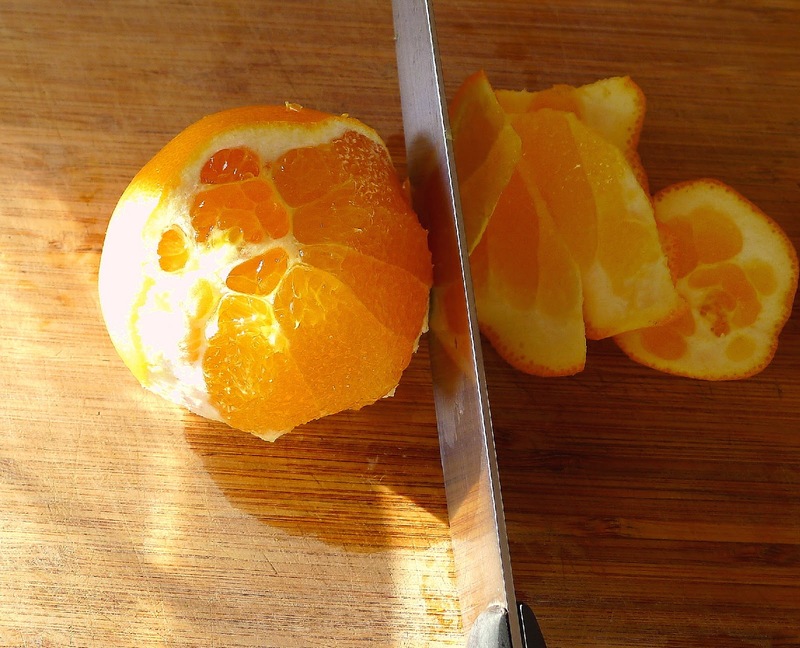 To cut up the oranges: Slice peel and white pith from the oranges, then cut them crosswise. Cut the slices into bite-size pieces. Bring a pan of salted water to a boil. Add the diced squash. When water returns to a boil, cook the squash 2 minutes and drain. Rinse in cold water to stop the cooking. Heat ½ teaspoon of the oil in a small skillet and toast the pine nuts. Reserve them. Add remaining oil, vinegar, oregano, pepper and ½ teaspoon salt to the squash. Cover and allow to marinate at least 1 hour and up to 12 hours. Shortly before serving, add the onion, olives, oranges and parsley. 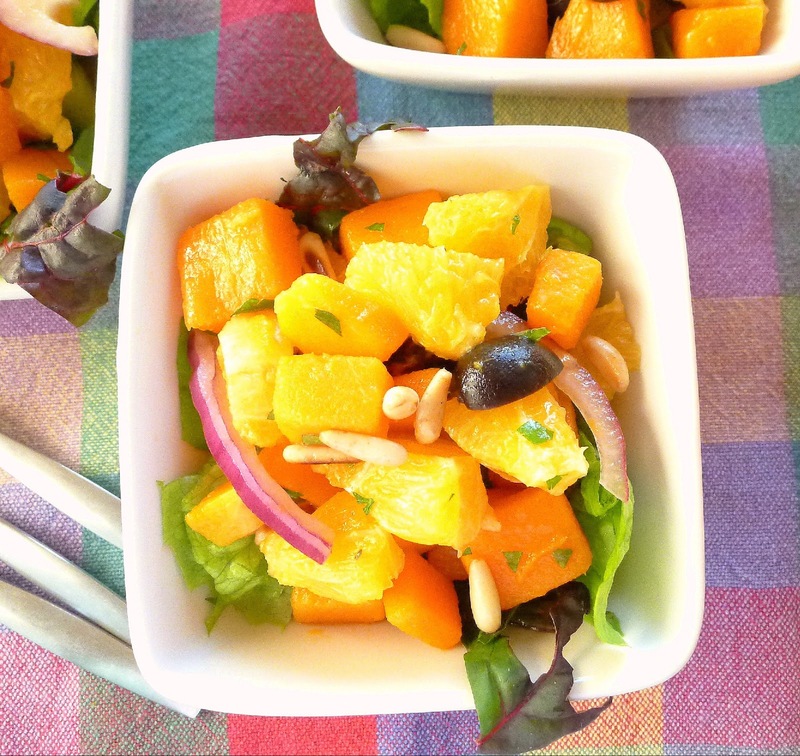 Heap the squash and orange salad on salad greens in a shallow bowl or on individual plates. Sprinkle with pine nuts. Holiday lunch in the sun. That's my son, Ben, and grandson, Leo. Besides the orange-squash salad, on the table are scarlet-pickled onions, mango chutney and partridge pâté (all those recipes appeared in recent blog posts). I also served roast turkey with a gluten-free mushroom and brown rice stuffing; dairy-free double-mashed potatoes; roasted brussels sprouts with walnuts; almond nougat mousse (recipe posted last week) for dessert along with bars of turrón (nougat) for the no-dairy guest. Avocado, grapefruit and fennel salad. 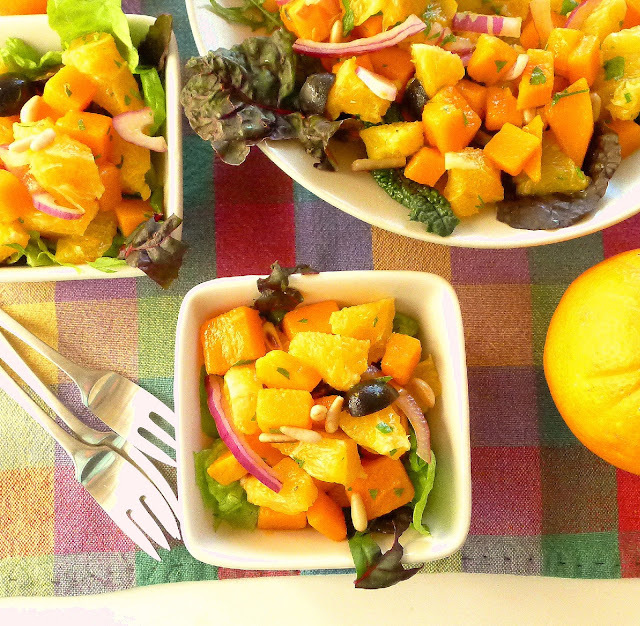 Sweet potato and clementine salad. Fish soup with sour orange. While shopping the other day at El Corte Inglés, a big department store with its own supermarket, I picked up their brochure advertising take-out catering for Christmas dinner. 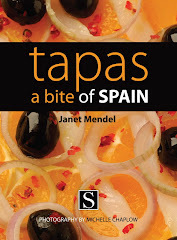 What a great inspiration for menu planning! 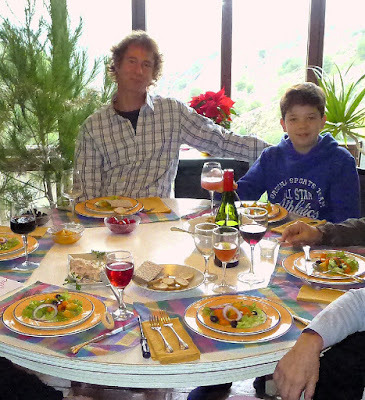 In Spain, the family Christmas meal, often very elegant, with an abundance of food and many courses, takes place on Christmas Eve. On Christmas Day, the family eats leftovers. And, what great leftovers! What’s on the menu? The Corte Inglés a la carte lists all the classics—shellfish to start, whether in soup, stuffed shells, salad or croquettes; besugo—sea bream—or another fish main course, as well as meat—baby lamb or kid, especially in Andalusia; roast suckling pig or beef tenderloin; stuffed chicken, turkey, pularde or capon. There is also a fixed price menu, at €28 ($29) per person, that includes starter, main, side dish and dessert. Here are the choices, with links to recipes. 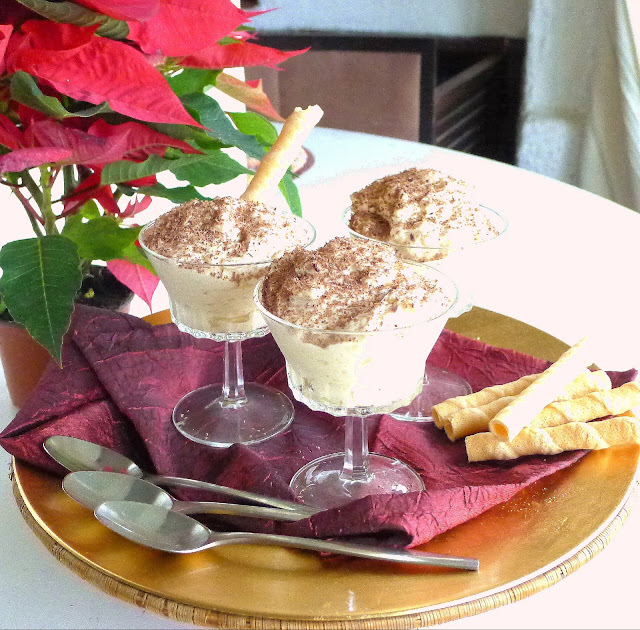 I’m making the turrón mousse for dessert! Turrón--almond nougat candy-- is essential at the Spanish Christmas table. 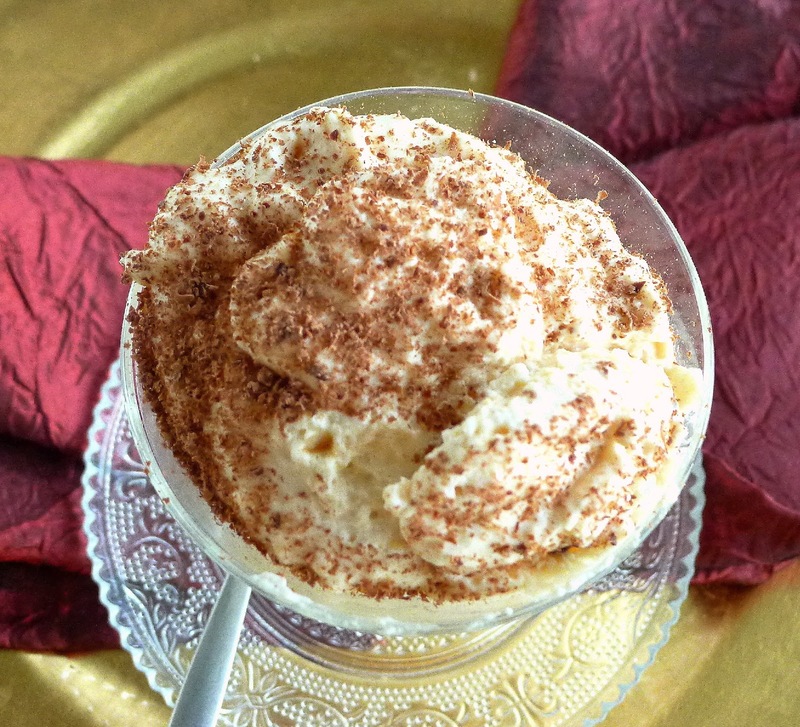 Here it is whipped into a foamy, creamy mousse. Fish terrine (Pastel de cabracho). Mille-feuille with boletus and truffle (Hojaldre de boletus y trufa). “Tigers” (stuffed mussels) (Mejillones tigres). Salt cod with garlickly pil pil sauce. 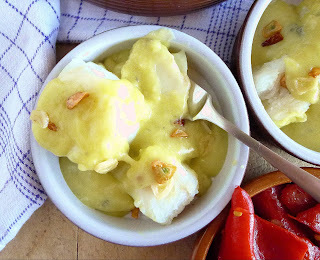 Salt cod in garlic pil pil sauce (Bacalao al pil pil). Basque-style hake (Lomos de merluza a la vasca). Roast suckling pig (Cochinillo asado). Oven potato casserole (Patatas panaderas). Vegetables sautéed with ham--a favorite side dish. Vegetable sauté (Salteado de verduras). 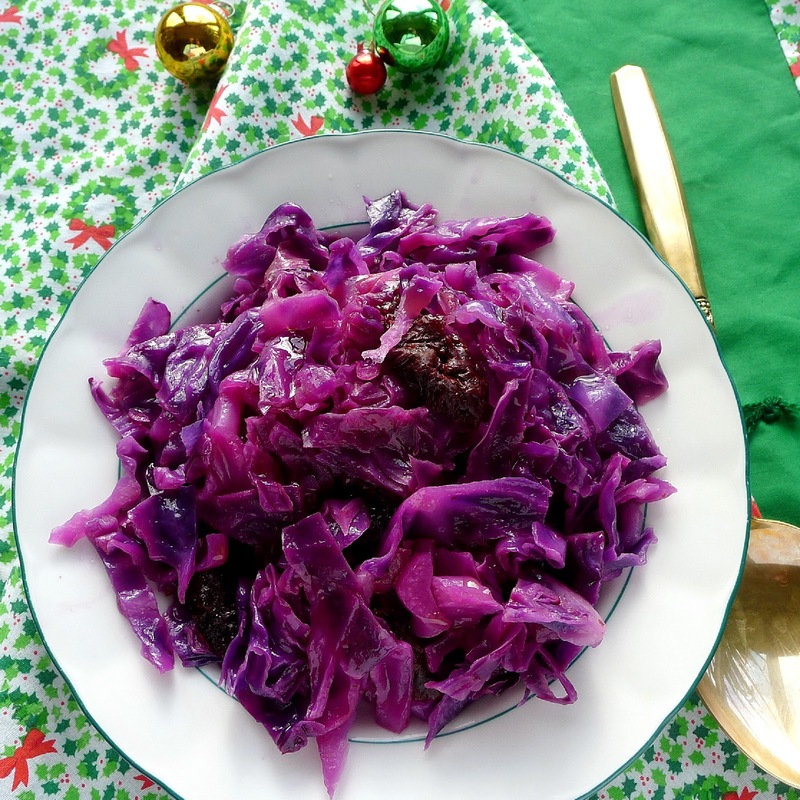 Red cabbage is traditional for Christmas meals. Chocolate pyramid (Pirámide de chocolate). 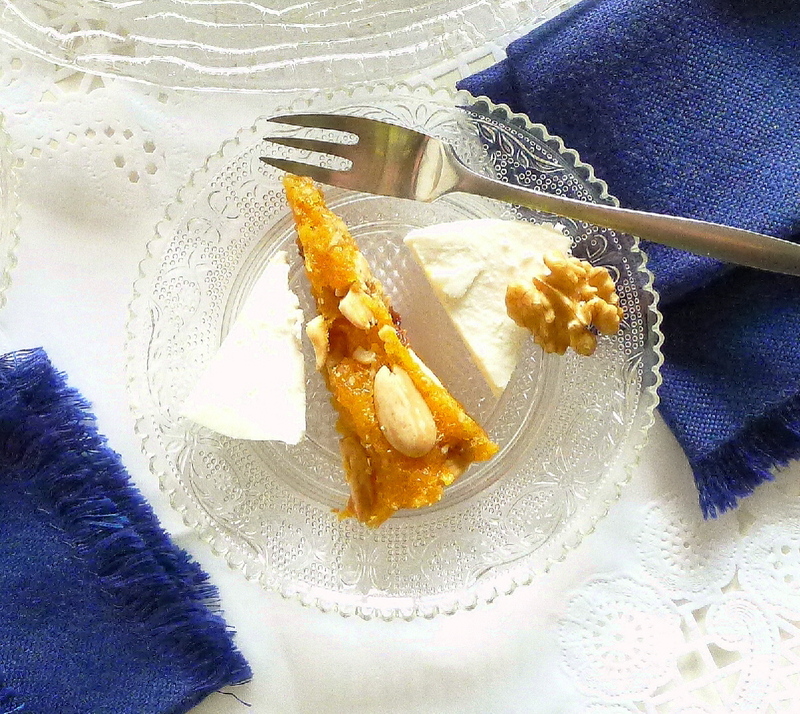 Mousse of almond nougat (Mousse de turrón). 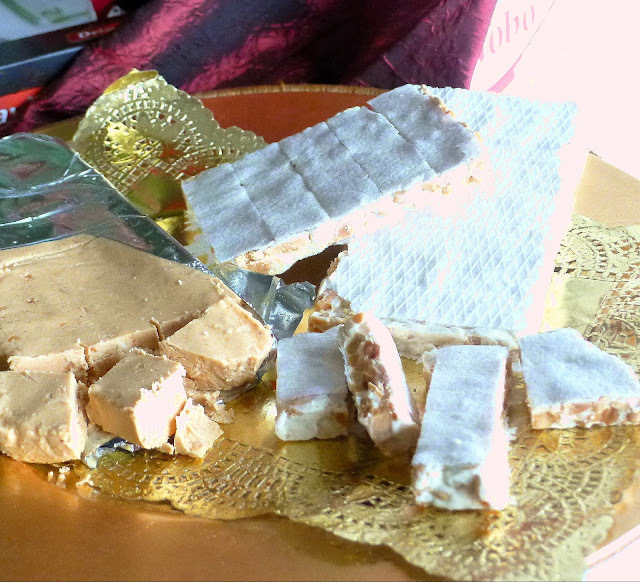 Turrón is almond nougat candy, confected of almonds, honey and egg white. Soft turrón, made of ground almonds, is like fudge in consistency. Hard turrón is a white nougat studded with almonds. Use one 250-gram (8.8-ounce) bar of soft turrón for this recipe. Crumbled and lightly packed, that equals about 1 1/3 cups. Chill the beaters and bowl before whipping the cream. In a small bowl, sprinkle the gelatin over the water. Let soak 15 minutes. Beat the egg yolks with sugar until pale and thickened. Heat ¾ cup of cream and the milk. Whisk the hot cream into the beaten egg yolks. 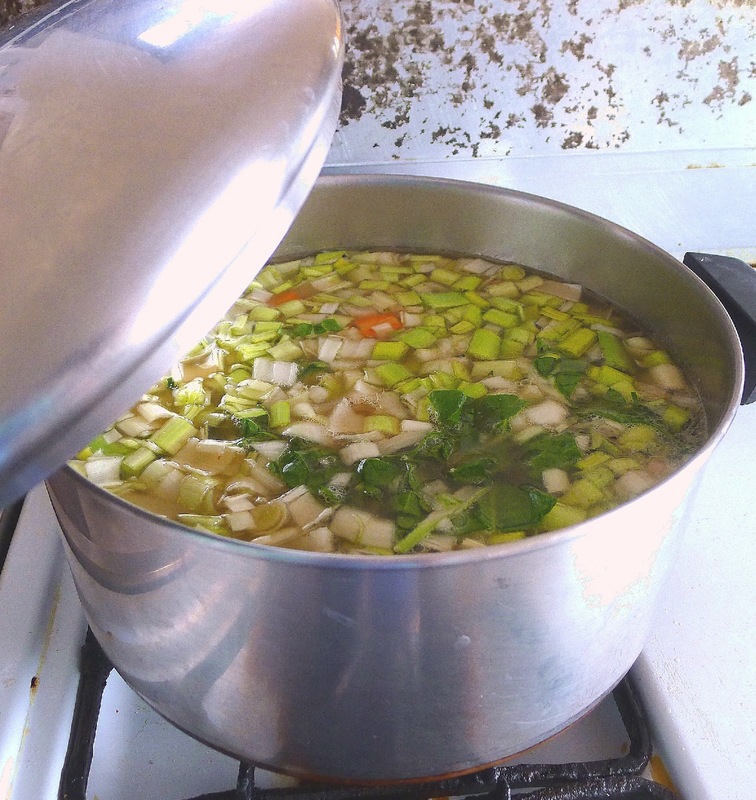 Return the mixture to the pan and cook, stirring, until slightly thickened. Do not boil. Remove from heat and add the orange zest. Whisk in the soaked gelatin until it is completely dissolved. Beat in the turrón. With clean beaters, beat the egg whites with a pinch of salt until stiff. Beat the remaining 1 ½ cups of cream until it holds soft peaks. Fold the cream into the turrón-custard mixture. Fold the egg whites into the mixture. 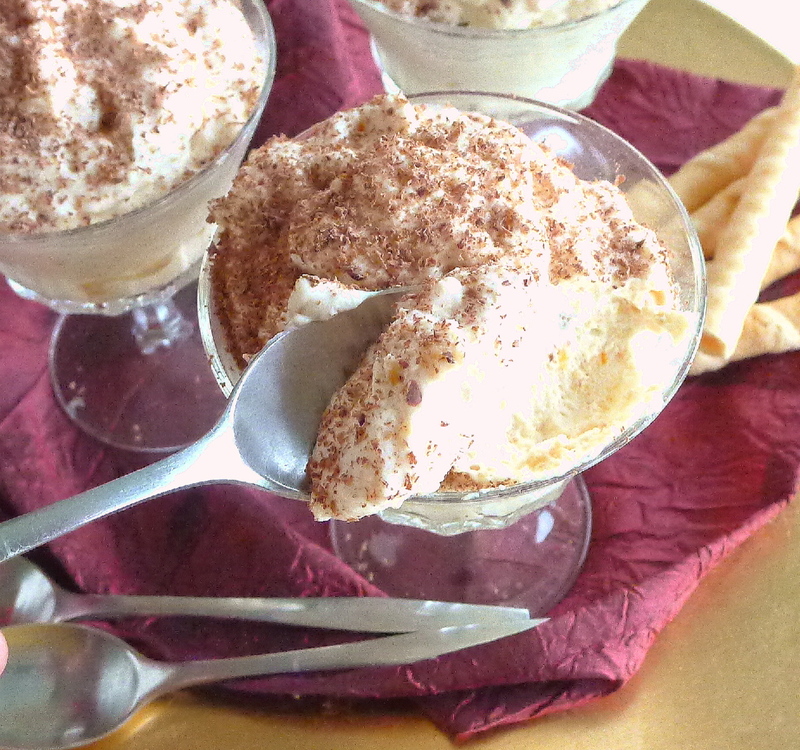 Spoon the mousse into 6 to 8 dessert cups. Chill the mousse at least 8 hours. Grate chocolate on top of the mousse before serving. Traditional at the finale of the cena de Noche Buena--almond turrón candy. On the left is soft, fudgy turrón; on the right, hard nougat studded with almonds, encased in white wafer. 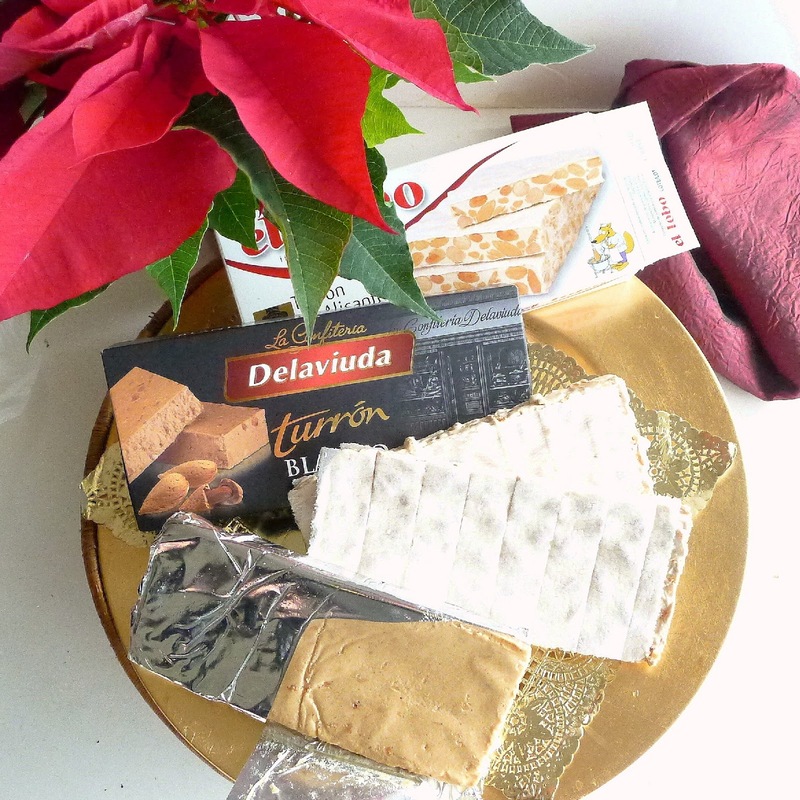 More about turrón from Spain at http://www.foodswinesfromspain.com/spanishfoodwine/global/products-recipes/products/more-about-products/4541662.html. Pâté or terrine is a dish for all occasions. We associate it, especially the pricey duck liver kind, with sumptuous holiday meals, but it’s just as appropriate for snacks. 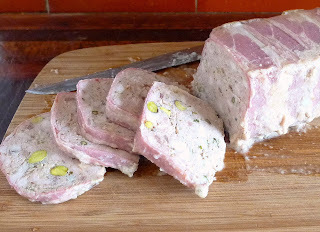 What I like about pâtés is that they’re not much more complicated to prepare than meatloaf, which they resemble. 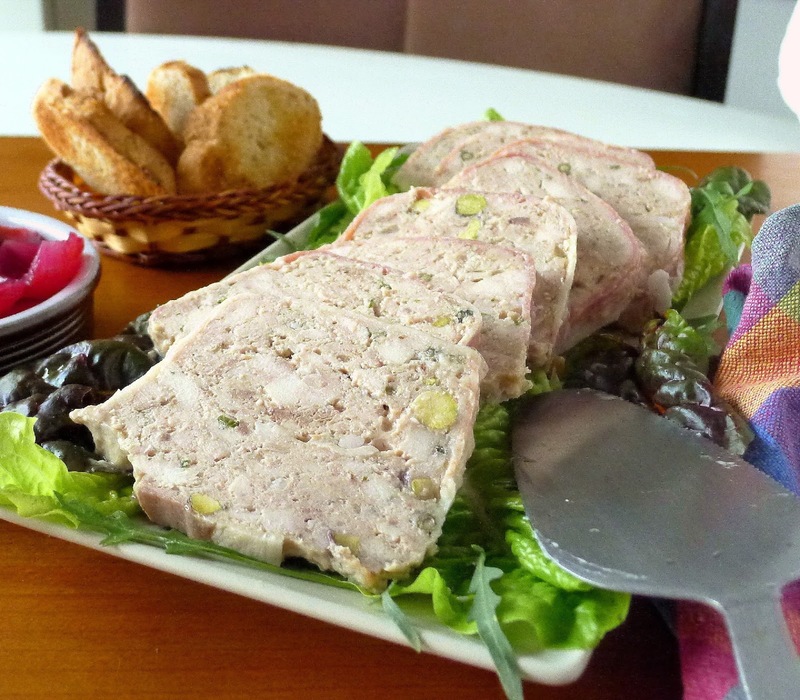 In classic cuisine, pâté means a forcemeat—a preparation of chopped meat or poultry—enclosed in a pastry case, while terrine is a similar mixture cooked in a loaf pan or earthenware terrine. In Spanish, all are called paté—without the cute circumflex accent—whether they are smooth duck liver or chunky country-style terrine. Studded with pistachios, this chicken pâté is great party food or simple supper. Ground dark meat, chopped white meat, coarsely chopped fat and livers give textural contrast. 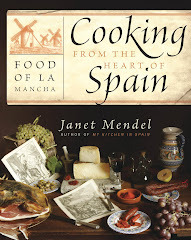 My house pâté is based on a recipe from La Mancha, where it is made with partridge. 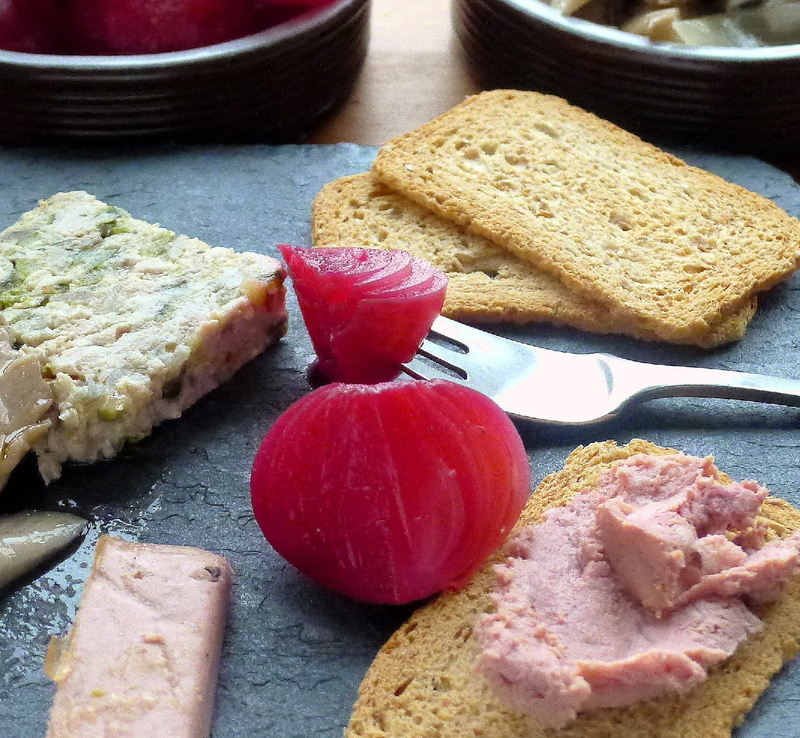 The gourmet version, potted and canned, is made with duck fat, giving the pâté a smooth, creamy consistency. My version is more home style. No partridge? No problem. 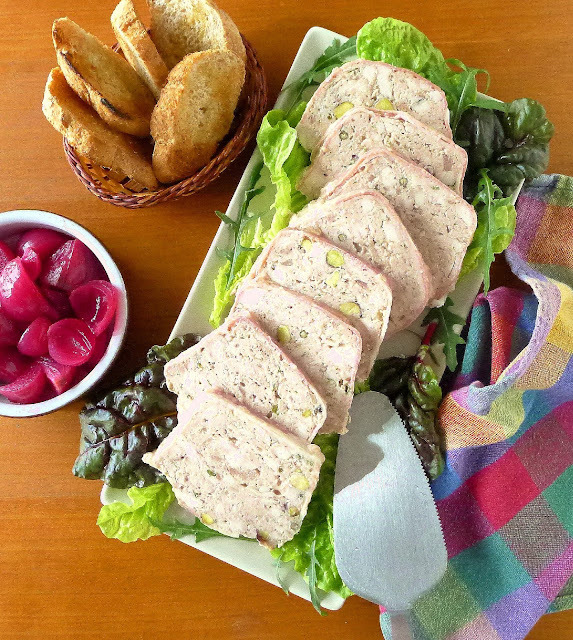 Make this pâté with all chicken or substitute quail, veal, or pork for the partridge. Use both white and dark chicken in the mix. Add truffles, if available. If not, use chopped black olives or pistachios or green peppercorns. 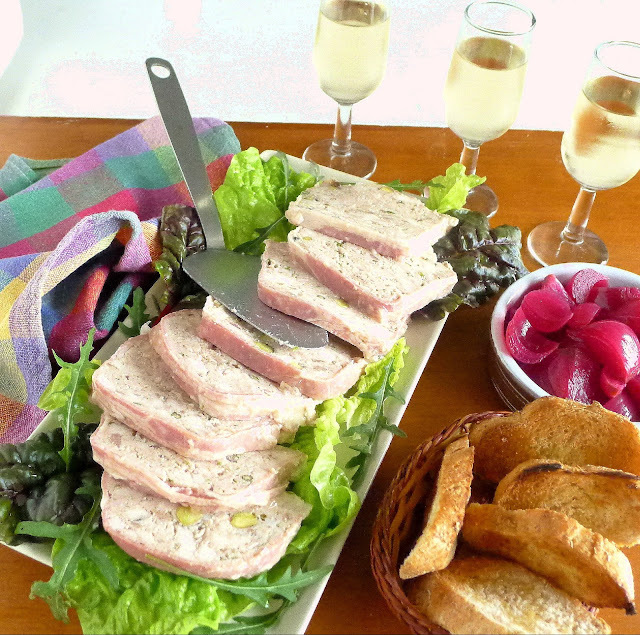 Serve slices of the pâté at room temperature on salad greens accompanied by pickled onions (recipe is here ) and toasts. Or, reheat the pâté and call it meatloaf! Sherry or red wine? I served fino Sherry with this chicken pâté. Red wine or Sherry with pâté? 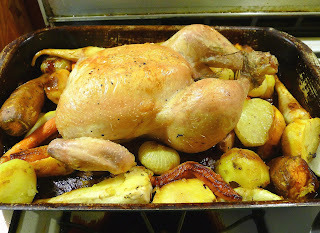 If I were using partridge, I’d serve it with a fine reserva red wine from La Mancha. 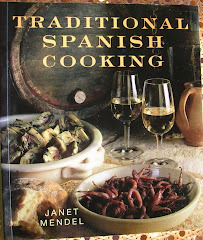 But today’s terrine is all chicken, so I’m pouring fino Sherry. Have the chicken thighs ground by the butcher, but, to provide some textural contrast, chop the breast meat by hand. Use a mini-processor to coarsely chop the pork fat and the chicken livers. The chicken livers are easier to chop if they are seared first. I usually separate the eggs and fold the beaten whites in at the end to lighten the mixture. I’m not really sure it makes a lot of difference, though. Vary the spicing and herbs to suit yourself. I like thyme. 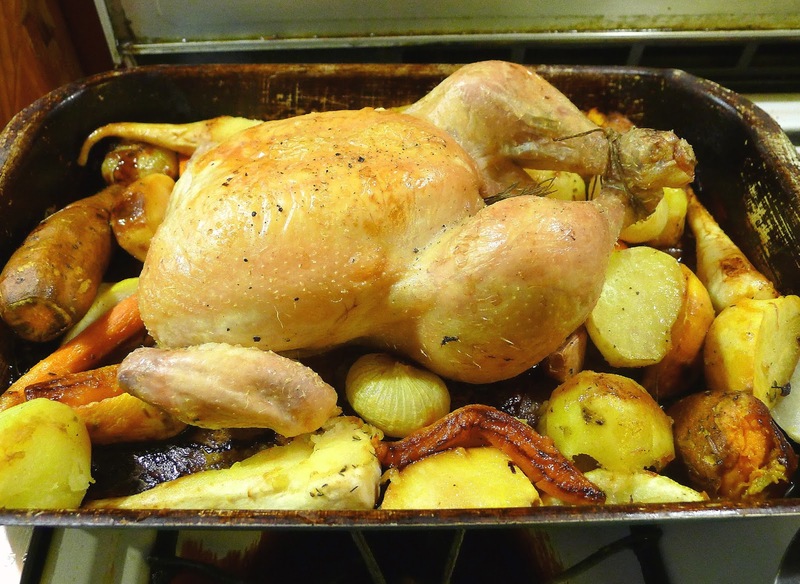 Nutmeg is good with chicken; fennel seed with pork, tarragon with veal. Let the forcemeat mixture season for a few hours before cooking it. Then test the seasoning: make a small patty of the mixture and gently fry or poach it in a small skillet. Taste and add more salt or seasoning if needed. The pâté keeps, refrigerated, for one week. 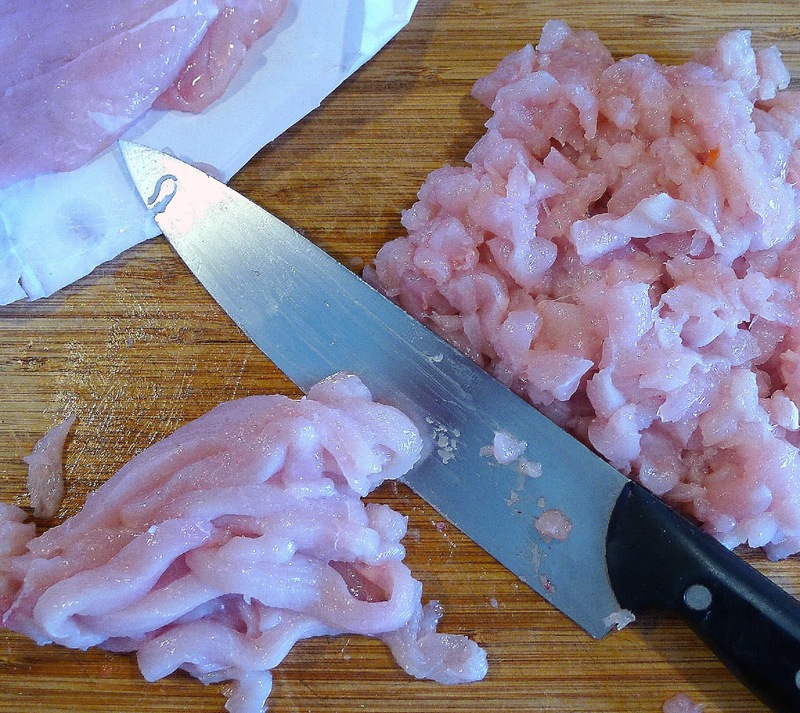 Combine the ground partridge or chicken, chopped chicken breast and ground pork fat in a large bowl. Cut the chicken livers into pieces and sear them in the olive oil in a small skillet. Transfer to a mini-processor and chop coarsely. Add to the bowl with the chicken. Combine the egg yolks with the milk in a small bowl. Add to the large bowl. Add the brandy, Sherry, salt, pepper, thyme, parsley and grated onion. Use hands or a sturdy wooden paddle to combine the ingredients very well. Allow the mixture to stand, covered and refrigerated, for at least 1 hour or up to 8 hours. Stir pistachios, if using, into the pâté mixture. Beat the egg whites until stiff. Stir 1/3 of the whites into the partridge paste. Fold remaining whites into the paste. 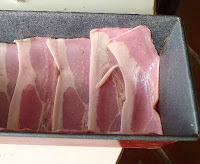 Line pan with bacon slices. 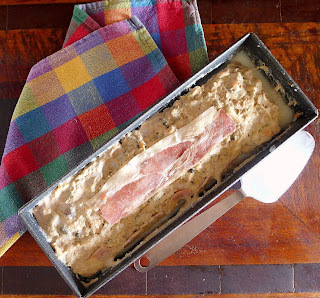 Line a 6-cup loaf pan (or two 3-cup terrine molds) with bacon slices. Place half the forcemeat mixture in the pan. If using truffles, scatter them on top. Spread the remaining pâté mixture over. Place the mold in a pan and fill to half the depth with boiling water. Cover the top with foil. Bake until pâté is set, internal temperature of 160ºF, 60 to 90 minutes (50 minutes for the smaller terrines). Allow the pâté to cool, then refrigerate. Unmold the pâté, draining off excess liquid, and slice to serve. Chill the pâté in the pan before unmolding it. Use serranted knife to slice the pâté. 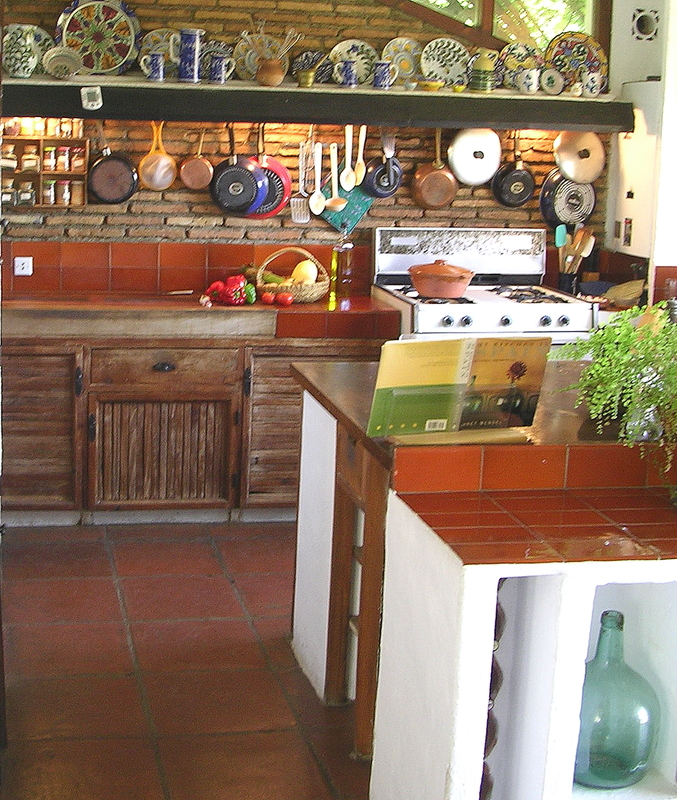 MY KITCHEN IN SPAIN GETS A REVAMP! Part way through my kitchen renovations, I am panicking. 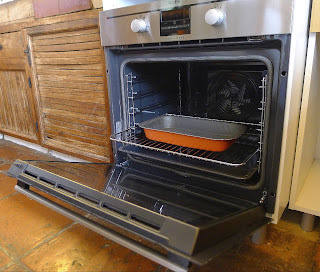 We just set the new oven in its niche and I realize it’s almost at floor level. What to do now? Find another location? Raise the stovetop? How did I miscalculate so badly? Luckily, I’ve got my revamper-in-chief, Peter Nielsen, to help me solve this and some other problems. Peter is an artist who earns a living by doing electrical work, plumbing, carpentry, masonry, and much more. 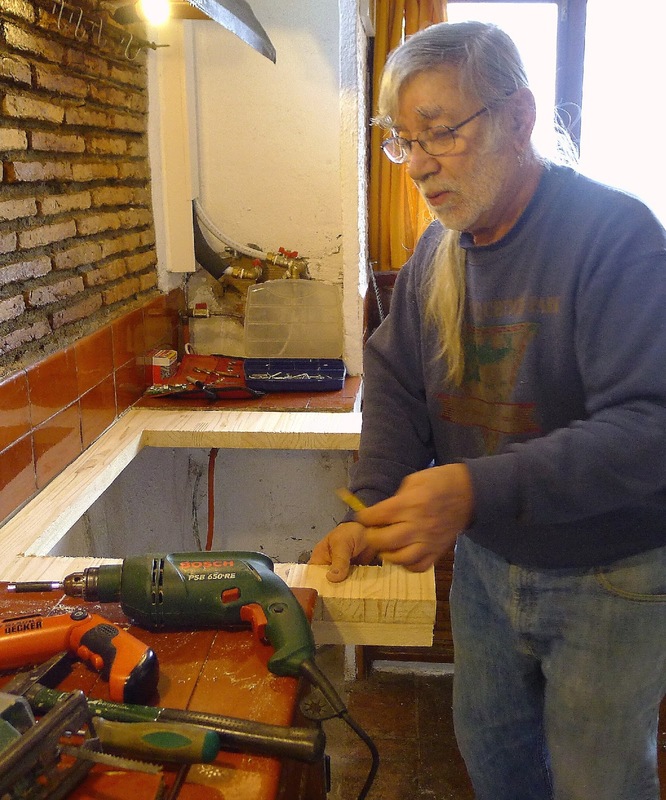 Peter placing new counter top in my kitchen. When I built my house in 1972, I custom-designed my kitchen to the specifications of the times. I had a dinky little Spanish gas stove, so I built my counter tops to line up with it, only 34 inches high and 19 inches deep. That, I soon realized, was not enough counter space to roll out a pie crust. Peter built me a center island to house a dishwasher and extend the counter space. My kitchen, with American range converted to run on butane gas and a center island with enough counter top for kneading bread, rolling out pie crust. 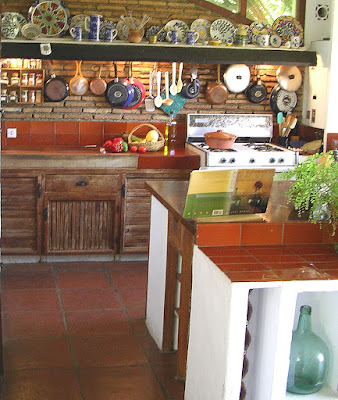 Ten years later, I acquired a big American stove, a MagicChef, purchased second-hand from an American military family leaving the US naval base at Rota (Cádiz, on the Atlantic coast of southern Spain). That necessitated knocking out some cabinet tops. The new stove stuck up much higher than my counters. 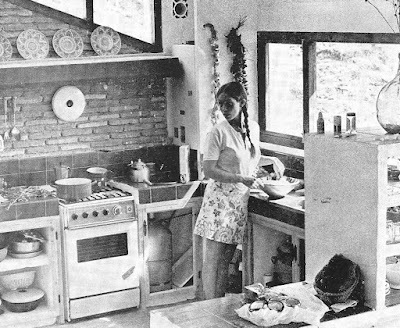 That stove has served me well through the years—family meals, dinner parties and recipe testing for eight cookbooks. When the thermostat stopped functioning, I got an oven thermometer so I could regulate temperatures. Clogged gas valves can’t easily be cleaned, as the tubing becomes brittle. That means I can’t get burners hot enough for good wok cooking. And, some invasive varmint ripped most of the insulation out of the oven, so it’s seriously inefficient to heat. 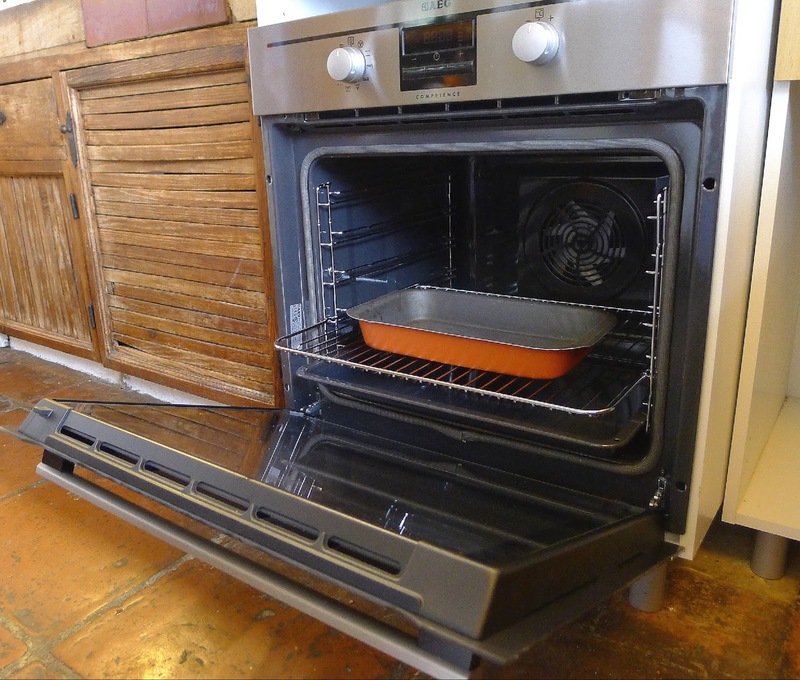 Adios to my big American oven. 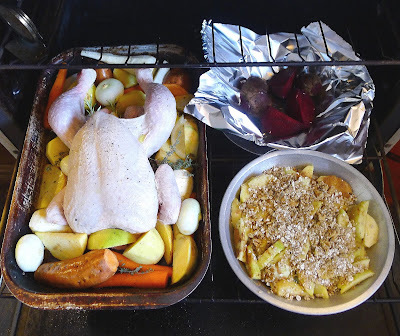 A whole chicken, apple crisp and beets roast on one rack. Peter at work in my kitchen. I've alerted him that Monday we're going to have to make some changes. Panic! The new oven is almost at floor level. It's not wired in yet, so I'm looking for a new plan. Cooking with gas is swell--but, as I get older, lugging butane gas tanks is a pain. (I got rid of gas hot water heater when I installed solar hot water system.) The new electric oven is way smaller than the old one. But, gone are the days when I roast whole turkeys with all the trimmings for eight to ten people. The induction cooktop only has three “burners.” But, hey, I can’t remember when I last needed four burners at the same time. During the renovations, we’ve moved the clunky gas stove into the dining room so I can still put meals on the table. With the kitchen en obra, in the works, I’m not doing a lot of cooking. My favorite soup pot for 50 years--aluminum with copper bottom--is soon to be decommissioned, as it won't work with induction cooktop. Peter Nielsen’s web site http://peteratplay.com/ shows samples of his art and photography. 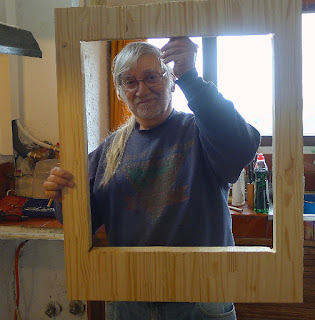 His fix-it and build-it artistry is on show in many homes in my area. My neighbor, Jan, wants to clone Peter. That's how important he is in our lives. Holiday meals go better with pickles! Something tangy to prickle the taste buds and contrast with rich foods. 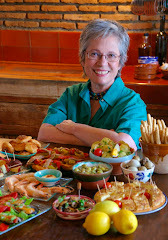 I like to make small batches of pickles and relishes and keep them in the fridge, ready to accompany a special dinner. 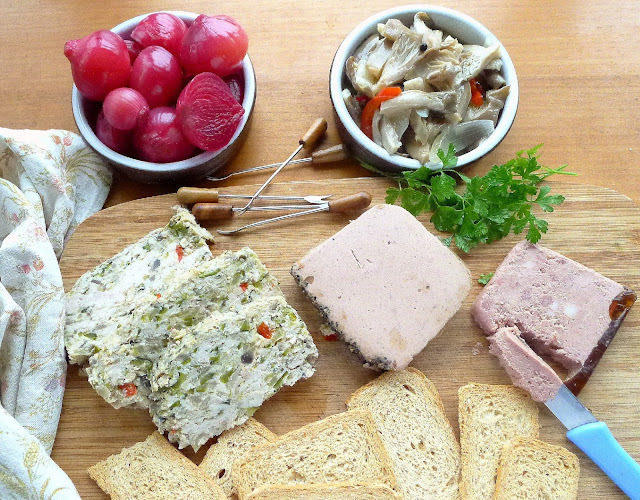 Pickled onions and marinated mushrooms are good accompaniments to a selection of pâtés. The mango chutney I made a few weeks ago was the perfect foil for turkey sandwiches. 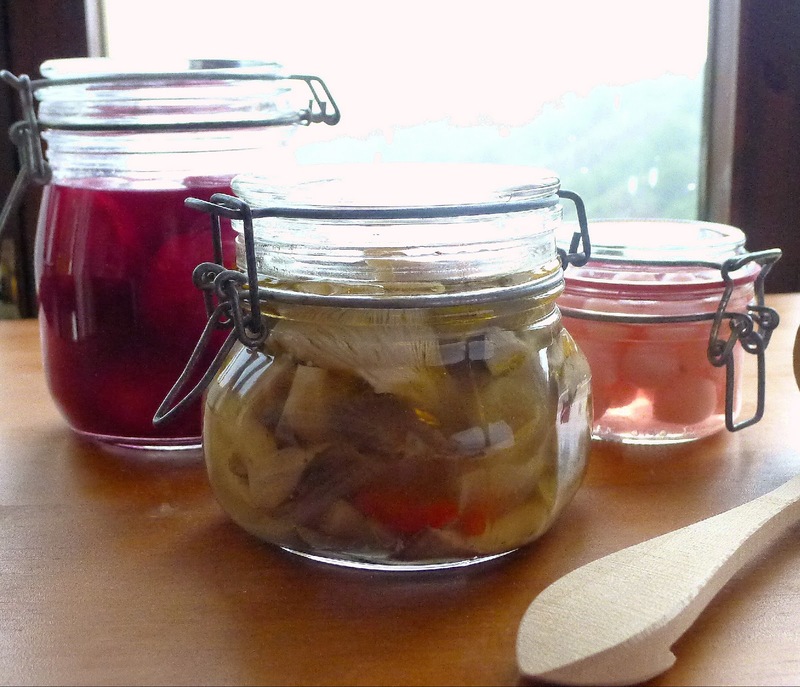 Thinking ahead to a drinks party—wine, cheese and pâté—I’m fixing some new pickled vegetables to go with it. One is marinated mushrooms. 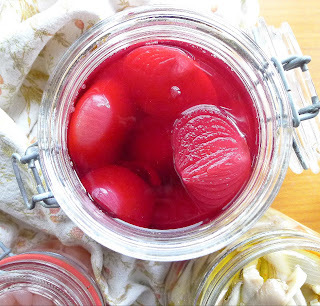 The other, scarlet-pickled onions, will also look festive with Christmas menus. Pickled oyster mushrooms in the center and two kinds of pickled onions. These are not true conserves, meant for long keeping, but small-batch pickles to keep in the fridge for several weeks. Bright flavors and colors provide contrast for holiday meals. 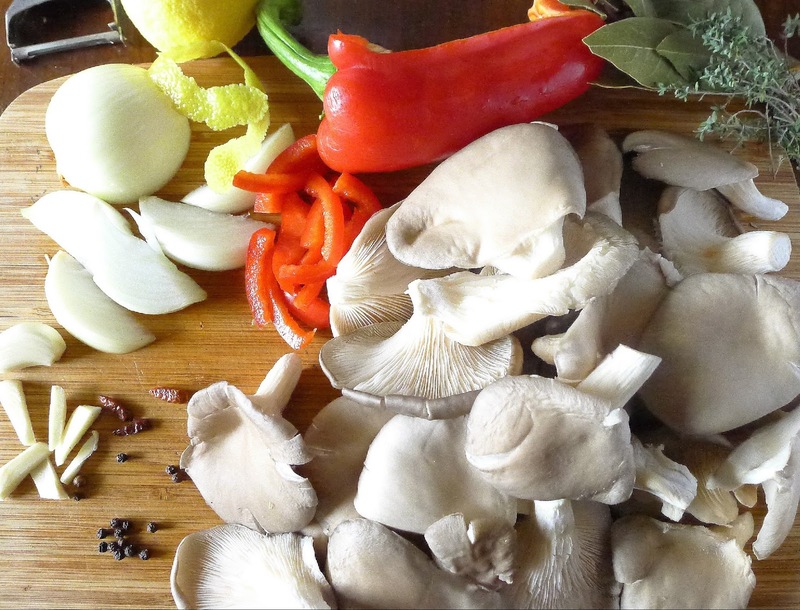 Mushrooms marinate with garlic, peppers, onion and herbs. Red beets color the small onions. Pickled mushrooms go with grilled foods and make a tangy addition to salads. 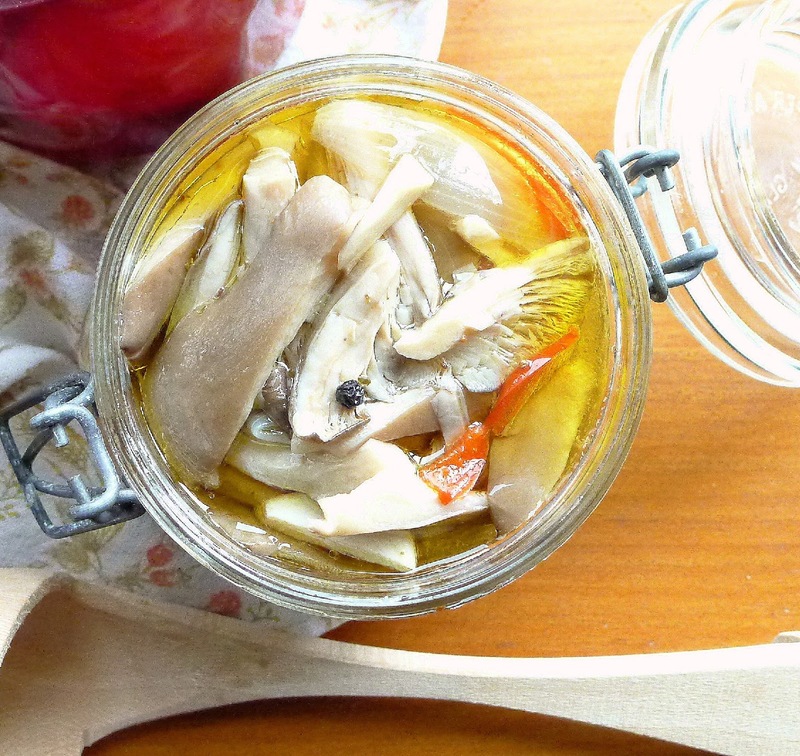 Country folk who forage for wild mushrooms have various ways of preserving them, by drying, by pickling. This recipe is not a real preserve, but it keeps well, refrigerated, for up to 2 weeks. Spoon the marinated mushrooms over grilled steak or add them to salads or soup. 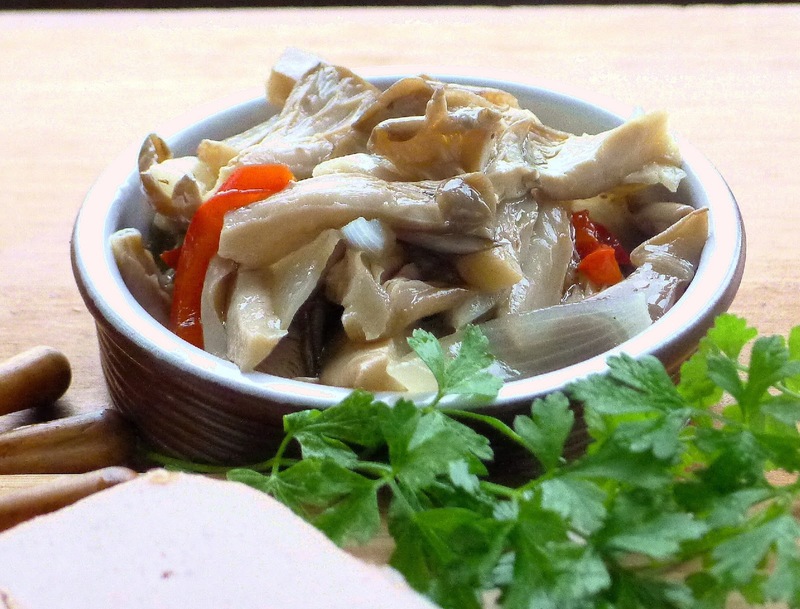 Oyster mushrooms work especially well, but you can use any variety of wild or cultivated mushroom. Slice or pull apart large ones. Wipe the mushrooms to clean off any soil. Trim away hard stems. Cut large ones into 2 or 3 pieces. Place in a pan onion, garlic, bell pepper, chile, lemon zest, peppercorns, thyme, celery seeds, bay, oil, vinegar, salt, and 2 cups of water. Bring to a boil and cook for 5 minutes. Add the mushrooms to the pan. Bring again to a boil, then simmer, uncovered, about 30 minutes. Let the mushrooms cool in the liquid 30 minutes. Ladle mushrooms into a glass jar or other non-reactive container. Add enough of the pickling liquid to completely cover them. 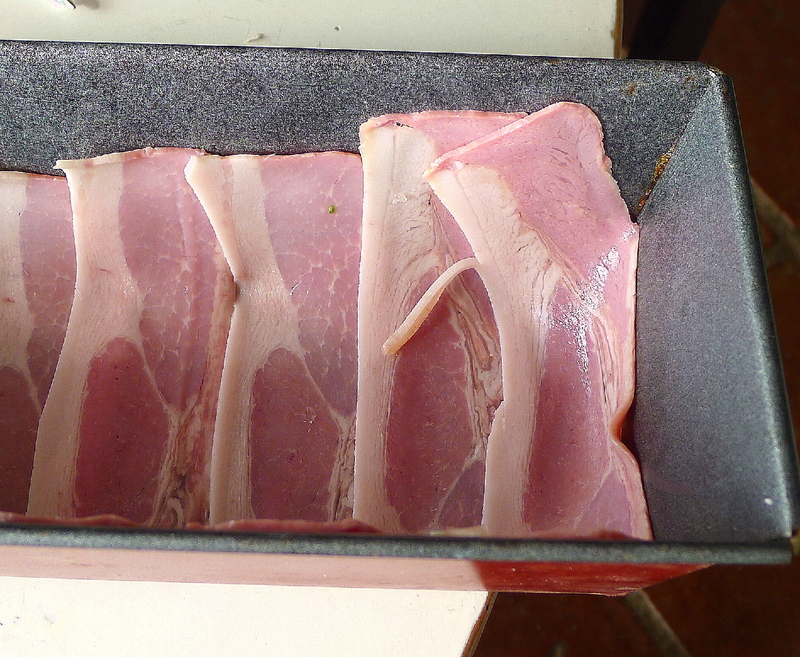 Cover the container and allow to marinate, refrigerated, at least 24 hours. Keeps up to 2 weeks. To serve, drain the mushrooms from liquid and serve at room temperature. In La Mancha (central Spain) I enjoyed the partridge pâté, a regional specialty. There the pâté usually comes garnished with scarlet-pickled onions. 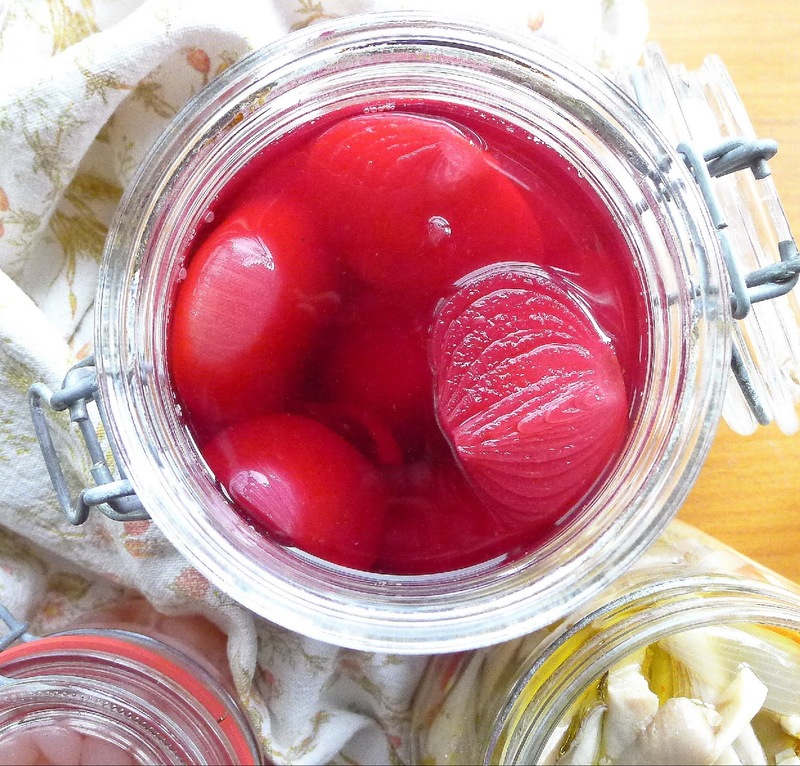 Colored with red beets, the onions make a nice contrast to smooth and unctuous foods such as pâté, but they also add pizzazz to salads or burgers. Soaking the whole onions in brine makes it easier to slip off the skins—and fewer tears, too. Sprinkle the onions with ½ tablespoon salt and cover with water. Let soak for 3 hours. Drain the onions. Peel them, trim root ends, and cut a thin slice off tops. Place onions in a non-reactive bowl and add water to cover. Sprinkle with ½ tablespoon of salt. Allow the onions to soak for 24 hours. Drain and rinse them. Combine in a saucepan the remaining ½ tablespoon salt, quartered beet, cloves, vinegar, and 2 ½ cups water. Bring to a boil and cook 5 minutes. Add the onions and cook gently for 10 minutes. Skim out the beets and reserve them for another use. Ladle the onions into sterile jars and pour the pickling liquid over them. Allow the jars to cool. 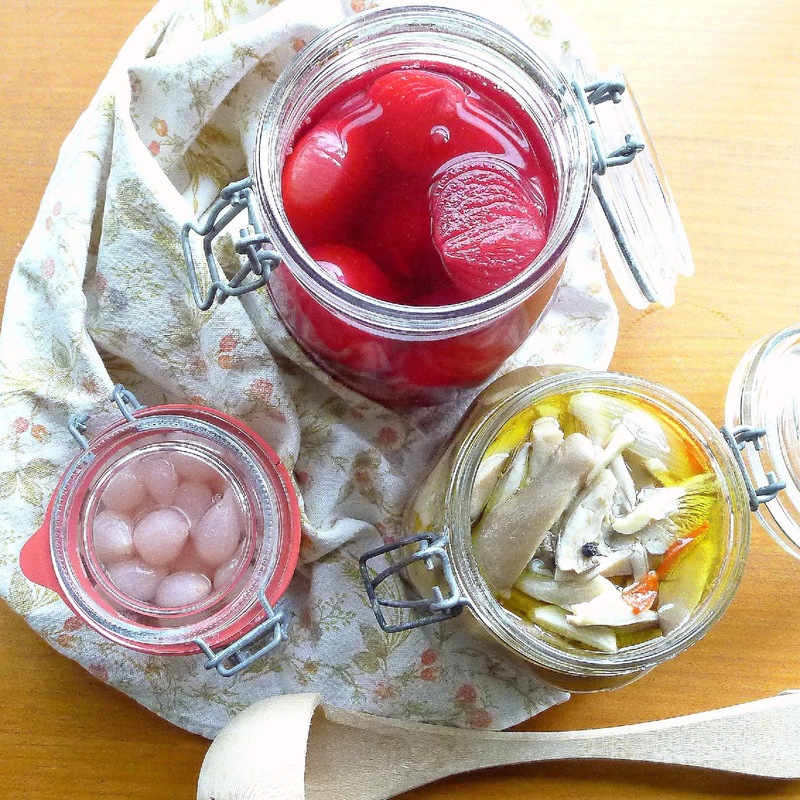 Refrigerate the jars of pickled onions. The onions are ready to eat in 5 days. They keep, refrigerated, up to 3 months.